NEW YORK, Sept. 21, 2017 /PRNewswire/ -- Global luxury real estate marketplace Concierge Auctions has unveiled its fall lineup of 15 impressive real estate offerings spanning eight U.S. states and three countries. All properties will exclusively sell via Concierge Auctions' online marketplace, conciergeauctions.com, allowing prospective buyers to bid digitally in real time from any continent. Of the 15 offerings, 14 will sell to the highest bidders Without Reserve. The latest roster includes two luxurious and historical French chateaus, an Alpine Montana estate and a mountain retreat and developable lot in Wyoming. "This fall, our diverse lineup of fine properties spans the U.S., Canada, and France — any of which could be yours at the tap of a finger,'" said Laura Brady, president and founder of Concierge Auctions. "In just a few short weeks, we'll invite bidders from around the world to name their price and own their dream home just in time for the holiday season." Two Jackson Hole properties located within Wyoming's exclusive Snake River Sporting Club will sell separately or collectively Without Reserve in cooperation with Ed Liebzeit of Jackson Hole Sotheby's International Realty. The first property, located at 585 W Lodge Cottage Drive, was previously listed for $2.395 million and is contiguous to 2.6 million acres of the picturesque Bridger-Teton National Forest. The 3,288-square-foot home offers four bedrooms with en-suite bathrooms, a full kitchen, and open living room. Nestled on a private knoll with green spaces, the property's outdoor features include a patio with panoramic views, a fantastic view of the 10th fairway of the Snake River Sporting Club golf course, a hot tub and fireplace. The second property, located at 985 Elk Ridge Road, was previously listed for $1.695 million and is set on more than seven acres. Surrounded by mountains overlooking the Snake River, the parcel offers the perfect opportunity for development, and its resort designation allows for short-term rentals. The Snake River Sporting Club boasts a variety of amenities including a fly fishing school, naturalist program, children's activities, and a world-class golf course designed by professional golfer Tom Weiskopf, which was ranked the best golf course in Wyoming by Golf Digest. "This luxurious home with beautiful mountain, river, and golf course views offers a unique opportunity to own a piece of Jackson Hole at your own bid price. The separate seven-acre lot is nearly surrounded by National Forest offering serenity while being close to a multitude of amenities and activities including at the Snake River Sporting Club," stated Liebzeit. "We are excited to bring this opportunity in partnership with the Concierge Auctions team. These property auction experts make the process easy and efficient for the new owner to bid and close on their new Jackson Hole home." One of France's finest examples of Troubadour architecture, Château Charbonnières is a 79-acre estate situated in the Perche National Park on the edge of the Loire Valley, just over an hour from Paris. Encompassing an impressive 33,000 square feet, the home features more than 20 bedroom suites and reception rooms including a music room, gambling parlor, grand salon, banquet room, and library. Additional accommodation includes a caretaker's house, parking, and stables. The estate was meticulously restored in 2010 to now include a cinema room, conference space, and home gym, in addition to new electrical systems, plumbing, and heating. The grounds also include a river that passes through the estate offering excellent private fishing, an orangery, and greenhouse. Its Gothic revival style became popular in the 19th century and inspired the Count of Chamois to update the original 16th century castle. The property has a significant history that spans centuries, having been frequently visited by Henry IV. Previously listed for €9million, the chateau will sell Without Reserve in cooperation with Tony Wells of French Domaines. 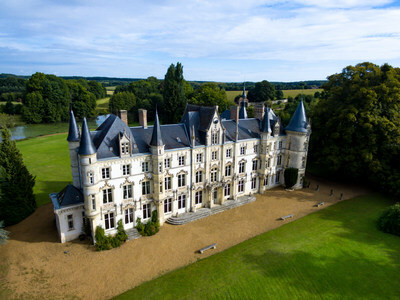 "With a picturesque situation between Chartres and Le Mans, both popular tourist destinations, and just 75 minutes from the French capital, we expect the chateau to attract interest from a wide range of potential purchasers, including Parisian families looking for a country retreat and savvy investors, who can see the property's potential as a boutique hotel or holiday business," stated Wells. "This grand property is fit for a king with its art and endless architectural features, taking one back to what life was like 200 years ago. It's also the perfect vacation home to completely disconnect from the city chaos and connect with nature," stated the current owner. "We've enjoyed the park and river located on the property by doing numerous outdoor activities like fishing, archery, golf, badminton, and hiking through the forest. At night, you can gaze at the stars and enjoy a sound sleep in complete silence. This area is truly the best." A heritage property situated in the Loire Valley, Château de Blancafort is home to some of France's most celebrated vineyards and idyllic scenery. Dating back to 1453, the chateau has been significantly embellished in the proceeding centuries, with Romanesque-style turrets and a French Baroque façade added in the 17th century. Inside, Hungarian parquet floors, Regency woodwork, and 17th century tapestries further complement its historic credentials. A collection of furniture and tapestries carefully curated by the owners is also available by separate negotiation. The estate is the home to a French count and countess, with the castle historically representing a favored haunt of European royalty. "The estate itself is very rich in history — from its architecture and landscape to its furnishings and décor — and my family has managed to carefully preserve its heritage over the past 60 years, while allowing for modern-day renovations," stated the seller, Count de Montjou. "Although the home is very spacious, it is very warm and cozy. We've hosted numerous visitors and wedding receptions on-site, allowing for others to connect with and enjoy the estate and iconic region as much as we have. This is a great opportunity for those who wish to own a piece of history." Covering 22,000 square feet (2,000 square meters) of accommodation, the chateau includes an elegant library and extensive wine cellars. The property is currently run as a successful wedding venue, with facilities in place including a 2,700-square-foot (250-square-meter) reception hall. In addition to the main castle building, the 42 acres (17 hectares) of grounds also contain a caretaker's house, tea room, chateau shop, and a six-bedroom guest house. The gardens have been landscaped to the exact specification of historic plans dating from the Renaissance period, and the surrounding parkland provides picturesque views. Previously listed for €4.95million, Château de Blancafort will sell Without Reserve in cooperation with Gina McIntosh of McIntosh International Prestige Property Sales. "What makes Château de Blancafort unique is the way in which it has been lovingly restored and maintained with the utmost attention to detail by the current owners, so it is in move-in condition and can be enjoyed from day one. Another attractive quality is the fact that it remains a majestic, authentic and historically-significant property spanning six centuries, yet still feels like a cozy home filled with light and warmth," stated McIntosh. "It will make a wonderful private home or business opportunity for the next family who is fortunate enough to acquire it at the upcoming auction." Nestled in Bridger Canyon outside of Bozeman, 1375 Moose Point Road features a hand-laid stone exterior that blends into its surroundings, a wood pergola entry, hardwood and tile floors, handcrafted millwork, and fir and cedar ceiling beams. The 6,328-square-foot Alpine estate offers four bedrooms, five bathrooms, an enormous chef's kitchen with top-of-the-line appliances, a sun room, home theater, fitness room, and guest apartment. With stunning valley and 360-degree mountain views, the property features seamless indoor-outdoor living, equipped with five terraces, an outdoor fireplace, barbecue area, and tree house. The property is comprised of 26 acres and also comes with a heated four-stall horse barn, a private pond, river, and meadow — home to diverse wildlife including elk, deer, moose, and cranes. In addition to surrounding state and national forests, residents have access to downtown Bozeman, a city with an abundance of history, museums and culture, located just 20 minutes away. Previously listed for $3.395 million, the property will sell Without Reserve in cooperation with Polly Anna Snyder of Engel & Völkers Montana Real Estate. "This estate is a custom-crafted jewel in Bridger Canyon, set on a gentle private knoll with bold, panoramic views of the mountains. Its extensive glass windows and doors capture the surrounding beauty and abundant wildlife, making it the ideal home for indoor and outdoor living year-round," stated Snyder. "A true nature lover's retreat, the property is in close proximity to various outdoor activities including fishing in the Paradise Valley and Yellowstone Rivers; hiking in Yellowstone National Park; skiing at the Bridger Bowl and Big Sky Ski Resorts; and hunting in both State and National Forest lands." In cooperation with John Zimmerman of Briggs Freeman Sotheby's International Realty. Never Before Offered for Sale. Selling Without Reserve. In cooperation with Kathy Christiansen and Gayle Ching of MacArthur Sotheby's International Realty. Currently Listed for $9.995 million. Selling Without Reserve. In cooperation with Mike and Darby Middleton of DPR Realty. Previously Listed for $2.9 million. Selling Without Reserve. In cooperation with Dave Domeij of Domeij and Associates. Previously Listed for $4.65 million. Selling Without Reserve. In cooperation with Patrick Dolan of RE/MAX of Boulder Inc. Previously Listed for $4.7 million. Selling Without Reserve. In cooperation with Billy Long of Ranch Marketing Associates and Kelli Gardner of Palladium Properties. Previously Listed for $23 million. Selling Without Reserve. In cooperation with Lars Cartwright of Four Seasons Sotheby's International Realty. Previously Listed for $1.995 million. Selling Without Reserve. In cooperation with John Wells of The Wells Group Durango. Previously Listed for $3.249 million. Selling Without Reserve. In cooperation with Joe Longton of Kuper Sotheby's International Realty. Currently Listed for $4.5 million. Selling At or Above $1 million. In cooperation with Barbara and Scott Walker of Coldwell Banker | The Walker Advantage Team. Previously Listed for $2.65 million. Selling Without Reserve. As part of Concierge Auction's Key for Key™ giving program in partnership with Giveback Homes, each of these sales will result in a new home built for a family in need. The firm's commitment will aim to build homes in Nicaragua — where the need for safe housing is critical.